The Hudson Yards Redevelopment Project is a joint venture by the New York City Department of City Planning and Metropolitan Transportation Authority to encourage development on Manhattan’s far west side along the Hudson River in Manhattan, New York City. The project includes a rezoning of the far west side into a new neighborhood called Hudson Yards, an extension of the New York City Subway’s 7 trains to the area’s eponymous subway station at 11th Avenue, and a renovation of the Jacob K. Javits Convention Center. The centerpiece of the Hudson Yards Redevelopment Project is the Hudson Yards neighborhood, a 26-to-28-acre mixed-use real estate development. The new construction is supposedly the largest ever of its kind. 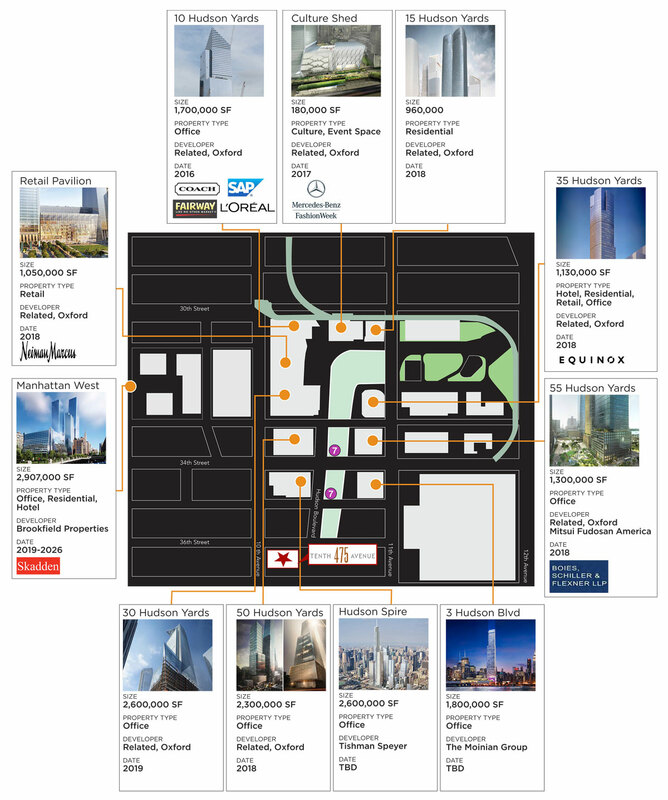 According to its master plan, created by Kohn Pedersen Fox Associates, Hudson Yards is expected to consist of 16 skyscrapers containing more than 12,700,000 square feet of new office, residential, and retail space. Among its components will be six million square feet (560,000 m2) of commercial office space, a 750,000-square-foot (70,000 m2) retail center with two levels of restaurants, cafes, markets and bars, a hotel, a cultural space, about 5,000 residences, and a 750-seat school. 475 Tenth Avenue is positioned just 2 minutes away from the 35th Street entrance to the new 7 Train Extension at the Hudson Yards, and 7 minutes from the A,C,E trains at Penn Station.